Clear, weather-resistant corrugated polycarbonate covering gives these greenhouses longer years of service.The 0.031(0.79mm) corrugated polycarbonate sheets are light in weight, virtually unbreakable and come with a 10 year warranty. 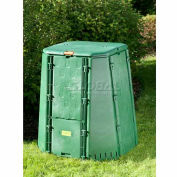 Panels contain UV inhibitors which prevent degradation. 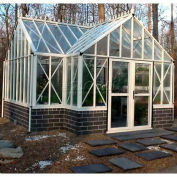 Built-in condensate control eliminates water droplet formation for a healthier plant environment. Sheets bend over 13' radius, quickly covering round style frame. 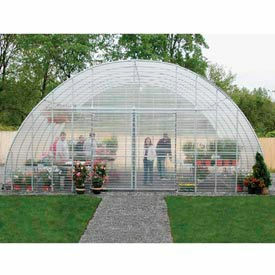 Greenhouse frame is manufactured from 14 gauge, Allied Gatorshield structural steel tubing with 4' rafter spacing. End framing is strong 16 gauge, 1.5sq. steel tubing.Heavy-duty, sliding double doors are 48W x 92H each and come complete with all necessary hardware for installation.Clear sheets have up to 88% light transmission.Heavy-duty ground posts are included.